To enjoy the tour in pleasant conditions, book the activity in spring or autumn. We are comparing Small Group Street Food Tour with a Local Guide Prices from leading ticket suppliers and Try to find you Cheap tickets prices on the market. 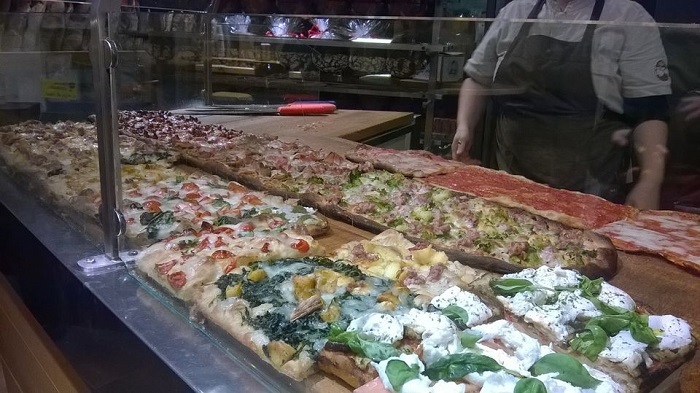 The walking tour introduces some of the best foodie places Rome, the capital city of Italy. Besides the local gastronomy, the professional guide introduces some historic sites of Rome dating back to the republican and imperial times of the city. Some specialties travelers will eat during the walking tour are cheeses, pizzas, risotto, seasonal fruits and local produce. Specially-selected wines, combined with appropriate specialties, are also among inclusions. The activity is also a historical overview of Rome, revealing the place where the conspirators assassinated Julius Caesar. Theatre of Pompei and Jewish Ghetto are also along the route of this entertaining guided tour. Joining the tour is especially recommended to first-time visitors to Rome during an early stage of their sojourn. This activity is tailor-made for gourmands and aficionados of the Italian cuisine. If you wish to learn more about the history of Rome and its off-the-beaten-path attractions, this tour is ideal for you. Your Experience With Small Group Street Food Tour with a Local Guide? Meet your guide in Campo de' Fiori and have a rewarding walk introducing the local cuisine. Lay eyes on top and lesser-known places of interest in Rome, such as the site of Julius Ceasar's assassination and the Great Synagogue. Sample cheeses, risotto, a heavenly pizza, gelato and zucchini flowers among other specialties of Italian cuisine. Combine dining with extraordinary wines where appropriate for the best experience. See remains from the ancient Rome and visit the Jewish Ghetto. Have a talk with the owners of a gelateria you visit. What Small Group Street Food Tour with a Local Guide Includes? Assistance of a licensed tour guide familiar with Italian gastronomy. Samplings of food, wine and desserts. Italy is one of the largest exporters of wine in the world, competing against Spain for the title in this area. This is one of the most authentic experiences in the city of Rome, far less touristy than most others, if touristy at all. Travelers Reviews about Small Group Street Food Tour with a Local Guide? According to the majority of reviews, the tour is a combination of excellent sightseeing and even better dining. Most travelers have a high opinion of the guides assigned to them, describing them as knowledgeable and affable. The comments indicate that travelers that took part in the activity were quite satisfied with the selection of food and the route they took. Besides to fans of food, the reviewers underline that the tour caters to history buffs. Some travelers state that food, walking and other points were balanced very well. Please get in touch with the operator you choose for the details regarding visitors in wheelchairs. Provide mobile or printed ticket to join the walking tour. For cancellations at least 24 hours in advance, you receive the entire amount of money you paid. Don't eat too much before the guided tour. The walking tour involves a lot of walking, so put on suitable shoes. Wear garments suitable for the current weather conditions. If the minimum number of participants isn't reached, you will be offered an alternative.